Hawaiian shirts make very pretty purses. You can find Hawaiian shirts in many different colors. Usually they are made of cotton, Rayon or linen. It's easy to find a Hawaiian shirt to use for this project. Any thrift shop in any town has at least 5 on any given day. People buy them and wear them once or twice and then clean their closet. You will need another cotton shirt for the lining. Sewing machine, thread, pins, scissors, measuring tape. I found some magnetic closures that are easy to attach but velcro can also be used. Also you will need 4 metal rings. I used gold colored key rings that are 1" wide. Remove the buttons and save in your button jar. cut both shirts up at the seams. Throw away the collars, yokes and cuffs. Cut a piece out of the back of the shirt 14" x 23"
On the front left sections of the shirts you will use the pockets in the lining of the purse. Measure 4" above the top of the pocket and pin. From this pin, measure 12" down, pin. Locate the center of the pockets and measure 4" to each side. Mark with pins. Cut out each pocket piece, 12" tall x 8" wide. Cut 4 more pieces (2 for each side of each pocket) 5" x 12". Sew these to the sides of each pocket with 1/2" seam allowance. Press over to one side and top stitch. pin both sides of the lining right sides together and sew across the bottom. 1/2" seam allowance. Open up and press the seam open. Fold up and sew the side seams up with 1/2" seam allowance. Press open. Take the 14" x 23" Hawaiian piece and fold it in half so that it is now 14" x 11-1/2". Sew up the sides with 1/2" seam allowance. Press the seams open. Turn right side out. open up the purse section and lay the side seam down against the bottom fold. Stitch across about 2" above the point. Repeat on the other side. Do the same for the lining. when you get all 4 corners sewn, clip the corners off. Measure the bottom of the lining between the stitching. I came up with 10". Measure the depth of the lining, mine was 3". Cut a piece of plastic canvas with these measurements. Cut a piece of fabric to cover the plastic canvas, 12" x 8" fold in half lengthwise. Sew one short end and the open long edge. There's no need to turn it right side out, because this is going in between the purse and the lining. Place the plastic canvas inside this and sew the open end shut. Stitch both ends of this to the corners of the lining. 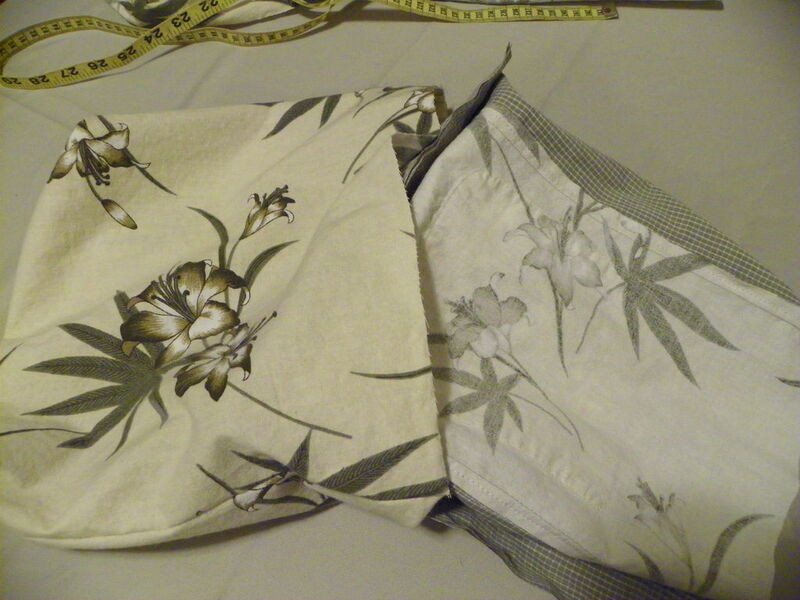 Place lining inside the purse and match up the side seams, fold down 1" on both the purse and lining. Pin at the side seams only. Locate the center of the lining at the top. Both the front and back of the purse. Pin. Measure down 1-1/2" at the center. this is where the magnetic closures will go. attach according to package directions. Since the lining is thin, I added a small piece of fabric on the wrong side of the lining to strengthen it. Cut 2 pieces of fabric 23" x 4". Fold in half lengthwise, press. Open up and fold the outside edges to the fold line. Fold in half again. Pin. Sew down the long side 1/4" from the edge. Sew up the other side. Cut 4 pieces 4" x 4". Fold and sew these the same way. Take each short piece and fold it around a metal ring. Pin. The metal rings are optional, I just think it helps it look more like a purse and less like a tote bag. Pin the strips with the metal rings in between the purse and lining. Measure 3" from the center of the magnetic closure to the handle. Which means that there will be 6" between the handles. Pin. Sew around the top edge of purse. Reinforce at handle straps. Place the long strips to the metal rings and pin at desired length. fold over raw edge and sew, making sure that both handles are the same length.